Although you avoided the pitfalls of tech-based transit tourism, I couldn’t help but notice that the trams, at least in the pictured photos do look like they have their own right-of-way—do you know if this is a historical artifact of some sort or a recent development? In any event, with their own ROW and stations I’d expect the trams to switch from double-deckers to articulated: since they have their own ROW the maneuverability aspect of the double-decker isn’t as important, and I’d guess articulated boarding times would be quicker. Although I’ve never been to Hong Kong, I stayed for a few months in Beijing and also came to love the Chinese double-decker. One of the routes I most often used was only accessible by overhead pedestrian bridge—it stopped at islands in the Third Ring Road, so following my desire line would have been suicidal. As of 2007, Beijing’s bus network was pretty well organized, too—although they still had the pile of signs, they were all part of one network and full network maps (though lacking frequency info) were available; even before I got the map I felt fairly comfortable doing bus-to-bus transfers. I only got lost once, and that was probably more a reading comprehension (my comprehensive bus map wasn’t available in English) than a network issue. Great blog. I wanted to say that you forgot the use of minivans which run later than the bus lines, which also help to connect different area stations together. My parents live atop Kowloon station, and they can access not only that MTR station, but Austin KCR station, all within less than one mile, the bus and minivans stop underneath the station for easy connections, and also provide a way to connect to say, the Mong Kok or Tsim Tsa Tsui stations, etc, etc. and it’s really easy. So although the MTR may show that its a little bit hard to get there, the ability to take so many transit options gives a lot of flexibility. And the bus system is great at connecting disparate parts of the system together, so we could take just one bus to get from Kowloon to Shatin and visit my grandparents. The other thing is that Hong Kong opens a transit line almost every few years in the last 10 years. That’s amazing. I live in Los Angeles now and take public transit a lot, but it really doesn’t yet compare the comprehensiveness of HK’s system. The reason everything is so disconnected (or appears so) is because everything is, in fact, run by different operators (or was built that way.) The East Rail line (light blue) dates from the early 1900s, and the KTL, TWL, and ISL (green, red, blue) were built as one system in the 70s and 80s. The Airport, TCL, and TKL (gray, orange, and a purple line not shown on the map) were all sort of added on later on, and the WRL (purple) was only really designed to connect easily to the ERL (light blue). The map you’re linking to also seems to lack details of the passageways connecting stations – there’s one between Central and Hong Kong stations, and one between Tsim Tsa Tsui and East Tsim Tsa Tsui. Sure, transferring’s kind of a pain, but at least in Hong Kong they’re clean, weatherproofed, and climate control (which is more than I can say about New York). I visit Hong Kong a lot, and in my time there I have never actually seen a full map with all the routes from different operators (possibly because it would be almost illegible due to sheer numbers). If someone could link to one, that would be great. Buses in Hong Kong are usually feeder routes – they either feed into the MTR system, or into destinations in the core. There is a lack of “grid” routes (then again, I haven’t seen a map, and I’m not a local) but the terrain mostly prevents that anyways – Hong Kong’s geography is fairly linear, most destinations are in the core or along MTR lines, and Hong Kongers consider it too humid and polluted to actually make a 15 minute walk to a subway station if there are more convenient options. Also, one final note: you were actually very lucky with your tram experience. The trams aren’t that new, and when they break down, they usually cause large bunching issues with all the trams behind them. Is there a problem with double-decker buses with people bunching on the lower level? Here in New York, it’s a task to get people to move towards the back of the bus. I can’t even imagine trying to get people up a flight of stairs. Regarding having bus terminal facilities are on unimaginably expensive real estate. Yes that’s how it was done in the old days. The ferry piers and the bus terminal next to it form import transit hubs. The ferry pier are mostly a thing of the past. But the bus hubs continues to multiply. They are usually on the ground level on any major developments. So tallest tower like ICC and IFC have them underneath. It actaully form some interesting contrast because the real estate on top are in fact unimaginably expensive along with all the expensive shops and high income residents. But when you decent into the ground floor it is a different world of the humble buses and un-airconditioned space. Interesting pictures of the ridiculously narrow sidewalk. When I grew up in this environment I never saw them as problems. I just walk around them and never thought much about it 🙂 People just adapt to the problem. No problem with double-decker buses. People often prefer upper level because they can have a comfortable seat and get some view. On the lower floor it is packed and you got pushed around. @ Paul – There are also double deckers with two sets of staircases, so you have people moving from front to back on two levels. I’ve seen them in Berlin a long time ago, not sure who else uses them. There’s also the cultural thing – in the UK, you just move further back because it makes sense to. Valuable real estate and transit. The most common transit in urban cores, one that is almost always free and electrified, actually occupies the most valuable of urban real estate, the elevator. If horizontal transit were as respected as the vertical, it too would be free and graced with the locations best suited to its needs. To go to Hung Hom from Causeway Bay is actually very easy. Hung Hom is on the Kowloon side of the Cross Harbour Tunnel. So any bus that cross the tunnel will drop you there. The locals have a different mental map than the MTR’s system map. The ERL line was a separate system only acquired by MTR recently. Someday it will extend to the Hong Kong side and it will be the single most important extension for the MTR system. Hi Jarrett. Interesting comment regarding double deckers vs articulated buses. Are you, or other readers, aware of the relative dwell times at stops? I had understood that longer dwells for double deckers were the main barrier to more widespread use in high density environments with frequent stops and on-off passenger churn. 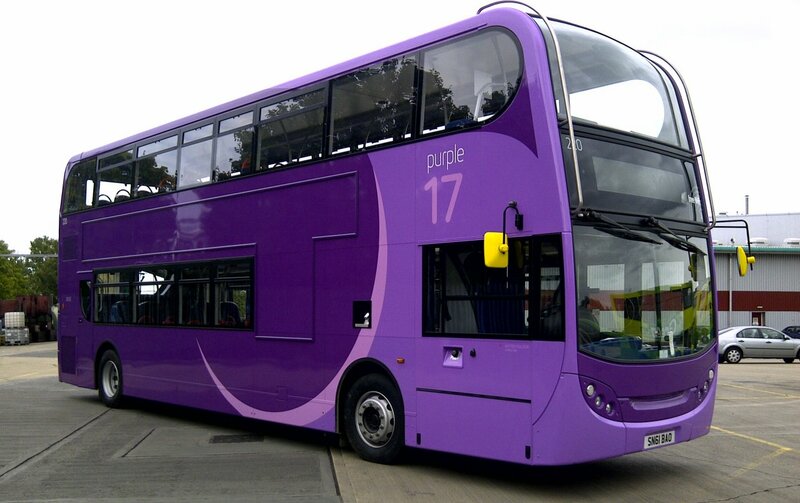 Articulated buses serve a different purpose than double decker buses. Double deckers are better for high capacity routes with long average trip lengths, articulated buses are better for high capacity routes with short average trip lengths. Ant6n. I think there are other factors, notably curb space. Currently working on transit plans for a very very crowded big-city CBD where curb space is the limiting feature capping the ability to get buses through. So that can make a difference. Another reason a lot of people like the MTR is because in the original system not only were transfers cross-platform, but there are two transfer stations between each line with cross-platform transfers in each direction. Any transfer can be done simply by walking across a platform. However, I also found that the MTR had some network issues, specifically with how the Tung Chung Line fits in with the rest of the system, though I think recent (and future) expansions would have helped resolve those. The buses really are difficult to use; even speaking Mandarin and some basic Cantonese it took me a lot of effort to figure out how to get from Olympic to Mong Kok, a distance of less than a kilometer! If you’re wondering why I didn’t walk, it’s because that would have taken me past a complicated roundabout and under an elevated roadway which I couldn’t figure out how to get past, and I couldn’t find an alternate route. For some reason many Asian cities that have the most car-hostile geography possible just can’t seem to get sidewalks right. As for Beijing, it’s good to hear they’re improving their bus system. When I lived there in 2004 and 2007 you had to understand Chinese to use it, and you had to know the name of the stop you were going to- not easy in a city of Beijing’s size. The buses also didn’t really form a user-friendly network, it was more of a everywhere-to-everywhere type system. We recently got free inner city buses, https://www.facebook.com/goklcitybus , that managed to get local taxi drivers knickers in a twist, http://thestar.com.my/news/story.asp?sec=nation&file=/2012/10/3/nation/12117853 . I hope SPAD stand their ground for the buses. I see Sydney and Brisbane have free CBD buses too. Is it that common? Being a pedestrian is tricky in Hong Kong, particularly downtown–it’s like navigating a maze. Many crossings of streets require use of skybridges between buildings or dropping into a subway station and coming out the other side. One thing that I always find interesting is that buildings mix with travel infrastructure (roads, transit) in ways that are generally unheard of in the west. On Kowloon, you have a freeway (sort-of) that passes through an office building, literally. Many malls and other buildings are built over freeways (and HK has lots of these); compared to the functionally segregated nature of many places in the US, HK reminds me of Blade Runner. Another problem with double-deck buses is passenger behaviour. Some UK authorities have had to close off the upper deck in late evenings due to vandalism and robbery of passengers. I haven’t heard of any vandalism issues with HK double deckers. Mind you, the buses are busy right up to midnight. Not surprising since many people don’t get off work till 8-9pm in the evening. With buses packed, there’s very little opportunity for major vandalism. My experience with dwell times on HK double deckers has not been bad. HK has had the Octopus smart card since 1997 and that has made boarding a cinch. Everyone just taps on and goes. In the past few visits to HK in the past few years, I have not seen a single soul board without one of these cards. If you boarded and paid by cash, I think the locals behind you would grumble because you are holding up the queue. The quickest way from Olympic to Mong Kok is by minibus. It’s extremely hard to figure out on one’s own. And not even all the locals will know unless they take the bus regularly. My uncle who lives at Olympic takes that bus into Mong Kok all the time, so he told me about it. I never had to take the tram until the last time I visited HK (I stay out in the New Territories when I visit so it’s buses and ERL all the time). My first ride on the tram was a dream. I got on at a terminus and rode into Causeway Bay. I had a great upper deck seat and it was relaxing. My second experience was around dinner time. It was crowded and the upper deck seats were all taken and you’re not allowed to stand on the upper deck. I felt like a sardine on the lower deck. But for HKD$2.30, it’s the cheapest ride in the territory, but it can be slow. The pedestrian situation in Hong Kong is indeed pedestrian-hostile in many ways, as everyone else agrees. As others have said, the transport connectivity is better than it appears — *for locals*. The full network of transportation is hard to perceive because of the large number of different (and competing!) operators, and the bus system is designed to be incomprehensible to foreigners. Finding a complete map is just not possible. My experience in London has been that passengers are self-sorting: those who are staying on for a longer journey go upstairs, those only taking a short hop stay on the lower deck. Similarly, people tend to come downstairs before the bus reaches the stop so they are ready to get off as soon as the door opens. Front-door only boarding has much more of an effect on dwell times than the upper deck. Las vegas runs the double decker buses, and obviously a huge portion of the riders are tourists. Even packed with people who may have never ridden a bus in their life, theres no issue with the bottom being crowded and the top empty. What a great trip you have! Even I am local here, I definitely agree with your advocacy of better mapping for the bus network, which is in fact in the bus operators’ own benefit. Young people growing up in the age of MTR have a tendency to rely on MTR more than on bus, the primary reason being the complicated bus network (and less directly, the half MTR fare discount for students!). Often, I suggest bus route to friends which is faster, but they refuse and stick to MTR instead! Do Hong Kong buses have validators at bus stops, allowing you to tap in and out off-board, or do you have to tape your Octopus on the bus? @ Alon Levy: No, and I don’t see it’s suitable here. Boarding/ alighting time in HK , however, is a concern in my opinion. Suppose 2 second per boarding passenger, it would take 4 minutes to fully load a bus with 120 capacity. Busy on-street bus stops can get seriously clotted up by the B/A activities, and spill over to block the road. The primary reason that there isn’t a dwell time issue with the double-decker coaches in Hong Kong is that operators begin driving as soon as the last rider boards the bus, instead of waiting for everyone to get seated as most systems do in the US. In Hong Kong, people know that they need to hang on, and they do. Moreover, riders prepare to deboard the bus as well, climbing down the stairs before the coach reaches their stop, and then deboarding immediately. My experience with double-decker coaches in the US is that riders (and many drivers) assume it is too dangerous to traverse the stairs while the coach is moving, which slows things down immensely. Validators are on the bus in the front only. The reason there are none at the back is that buses have a set fare, and this fare is different for every route. The amount of fare charged is based on the assumption that one gets off at the terminus. If you wanted to get off a few stops for the MTR station for instance, you won’t be boarding an express bus to a suburb because you would be charged more than a local bus. The only exception to this are some selected bus routes in the outer neighborhoods where you will be charged the maximum fare and be reimbursed depending on what zone you disembark at. This works in Hong Kong because of he frequency of buses for every single route. It is easy to figure out the Hong Kong bus system, if you use the Google Maps trip planner tool. In many, many cases, there are bus routes that are quicker for certain trips than taking the MTR. For example, there are several bus routes that cross the Cross Harbour Tunnel between Causeway Bay and Hung Hom. Good point — I last visited Hong Kong before Google Maps. Given that the Hong Kong buses follow UK operating practise, will you be venturing to these shores next Jarrett? London would be the obvious place to view a massive double decker bus system, plus it is a regulated network that you are familiar with. If staying for a few days there are three provincial towns/cities a short distance from London where you would see quality urban double decker bus operation in the deregulated environment. These being Oxford, Reading, and Brighton & Hove. Regarding bus stop dwell times, London with almost universal use of Oyster Cards, cashless boarding in Zone 1, and dual-door buses dwell times are short. Oxford, Reading, and Brighton all favour single door buses, the provincial standard layout. 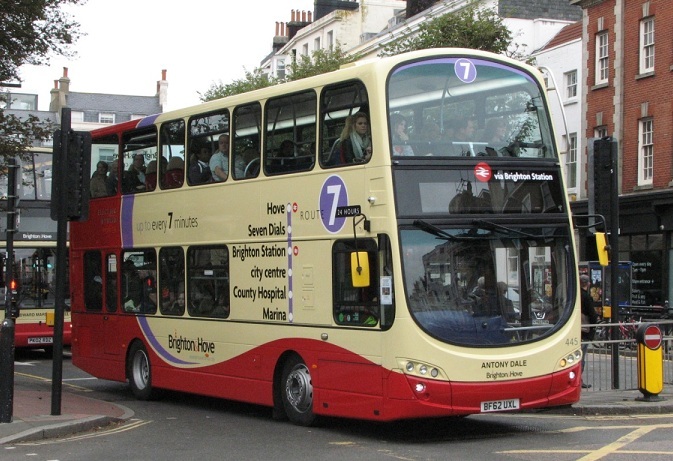 Reading and Brighton have a simple flat fare system, Reading Buses do not give change. All offer smart cards so boarding times are minimised. Oxford and Brighton are part of the Go-Ahead Group. Reading is a municipal. Also in UK urban areas buses do not wait for passengers to be seated before pulling away from stops. As in Hong Kong you learn to hang on, especially on the stairs. Alighting passengers press the stop button and then make their way down stairs (or at least as far as the top of the stairs) ready for a swift exit when the bus stops. Typical London bus lower deck layout. The stairs are at the front right behind the padded wheelchair backrest. Note the destination display on the bulkhead. This is part of the ‘iBus’ system fitted across the fleet and will alternate between the route number with ultimate destination and the next stop name. An audio announcement will also give this information. Wheelchair users board at the centre door which otherwise is for exit only. Video of trip on East London Transit route EL1 showing boarding passengers using oyster cards, iBus audio announcements clearly audible but not intrusively so, ‘bus stopping’ sign illuminated when stop button pressed and exit via centre doors. The bus networks are confusing mainly because there are three providers (First Bus, KWB and Citybus) with different routes. The upside is the vast array of choice, meaning if you miss a bus you never have to wait long for another one (same route or different) that gets you ‘near’ your destination. Hong Kong is superior to Toronto. Toronto, not enough rapid transit, transit expansion is used for political gains, and everyone almost needs a car. You don’t need to own a car in HK!! Hi Jarret, thoroughly enjoy your blog. I’m a HK-born Singapore resident who has lived in Hong Kong in the past (and still visits once in a while). Your point about bus terminus locations in HK is interesting, but it misses the point that they exist because of the relative cheapness of travelling by ferry across the harbour in some cases favours ferry-to-bus transfers rather than a straight route by bus. Also, the division of the urban core (in other words, a commercial sprawl) in Hong Kong by the Victoria Harbour, and the traditional geographic separation by the water body (HK-ers speak about living on Kowloon and HK Island very differently), also effectively makes the public transportation vaguely resemble that of two separate cities in two different countries of close proximity (perhaps like Dover and Calais)? Bus routes are purposefully segregated to serve their respective territories so as not to overly congest the limited capacity of the tunnels linking the two places. When the above conditions do not apply, as in Singapore’s case, most bus terminals can be located outside the city in suburban centres, and simply run through the urban core and be just as effective, if not more (fewer transits, for one). The bus terminus at the ferry terminals in HK sits on prime real estate, but Victoria Harbour is being constantly subject to land reclaimation works so this matter becomes less important. When it becomes important, the possible outcome is to develop a mixed-use complex with the terminus at it’s base. The essential reason that there isn’t a stay time issue with the twofold decker mentors in Hong Kong is that administrators start driving when the last rider loads up the transport, rather than sitting tight for everybody to get situated as most frameworks do in the US. In Hong Kong, individuals realize that they have to hold tight, and they do. Additionally, riders get ready to deboard the transport also, moving down the stairs previously the mentor achieves their stop, and after that deboarding quickly. My involvement with twofold decker mentors in the US is that riders (and numerous drivers) expect it is excessively hazardous, making it impossible to navigate the stairs while the mentor is moving, which backs things off colossally.